As Hurricane Lane makes its way towards the Hawaiian Islands, we ask that you all stay vigilant and informed of the storm’s ever-shifting condition throughout the remainder of this week. The storm’s impact on our state is still pending, but I urge everyone to prepare as best you can, and to kokua those who need help if you are able. Lane is currently a category 4 hurricane traveling at a speed of 8 mph with maximum sustained winds of 145 mph. There are currently hurricane warnings in effect for Hawai‘i County, Oahu, and Maui County, with a Hurricane Watch in effect for Kaua‘i County. With the constant shifting of the storm’s path, speed, and wind condition, please check the resources listed at the end of this message regularly for the most up-to-date information on Lane. * As an additional note for members residing in the City & County of Honolulu, the Honolulu City bus will be ceasing operations as of 6:00 pm Thursday (8/23) evening. With the storm expected to last 36 hours, please plan on the bus service to be out of operation through Friday (http://thebus.org). While preparations are important, the personal safety of people is always our priority. It is my hope that everyone remains calm and has disaster plans in place, both at home and at work, wherever that may be. We encourage you to help your associates/family members become familiar with your emergency plans, and to review them thoroughly. We also strongly suggest that you prepare a 14-day survival kit, as we are in the midst of hurricane season. Please click here to download HiEMA's 2-week preparedness brochure. The HLTA office will be operating with limited staff over the next two days, as I know many other businesses are, in an effort to encourage our staff to prepare their families and homes for Lane. If the Visitor Industry Command Center is activated, we will have a presence at the Convention Center as well. To all our members, family, friends, and loved ones, please stay safe through the impending storm. This year, I am thrilled to announce that our Visitor Industry Charity Walk has set records across all counties! Kaua‘i and Hawai‘i Island had substantial year-over-year increases with $363,100 and $320,000 raised on each respective island. Maui County continues to set the bar higher as they closed out the 2018 Charity Walk with a grand total of (over) $1.4 million. Finally, with last-minute monies rolling into the HLTA office, Oahu was able to crack the half-million mark with a new record of $507,800 raised. Therefore, the new grand total from our 40th annual Visitor Industry Charity Walk now stands at an unparalleled $2.6 million! I would like to send a very big mahalo to all of our chapters, our members, and to the community for your kokua in this banner year. That being said, August and September marks the season of giving as we award worthy non-profit organizations from across the state with monies raised from Charity Walk. The Maui Hotel & Lodging Association held their check distribution ceremony on August 9th at the Westin Ka’anapali Ocean Resort Villas, the Kaua‘i Chapter followed suit this past Wednesday at the Kaua‘i Marriott Resort (Charity Walk takes giant step, The Garden Island), and the Hawai‘i Island Chapter will be holding their distribution event at the Waikoloa Beach Marriott Resort & Spa on August 29th. To close out the year, we will be handing out allocations to Oahu’s many deserving charities on September 13th at Roy’s Eating House 1849 Waikiki. HLTA President and CEO Mufi Hannemann, Scholarship Golf Committee Chair Don Takaki, 2018 Bob Holden Recipient Symphony Broden, HLTA Vice-Chair Michael Jokovich, HLTA Vice President Dean Nakasone at our 19th Annual Scholarship Golf Tournament last week. Through its Hawaii Hotel Industry Foundation, HLTA sponsors scholarships for college students majoring in travel industry management programs and awards outstanding high school students for their leadership in the community. Our philanthropic mission is to provide educational opportunities to students who have a strong motivation to improve tourism in Hawaii and strive to be future leaders in the hospitality industry. A great example of our scholarship is our 2018 Bob Holden scholarship recipient, Symphony Broden. Broden was presented with her scholarship at our Golf Tournament awards reception. Originally from Texas, Symphony moved to the islands to pursue her dream of becoming a hotel general manager. Symphony is currently a junior at the University of Hawaii-West Oahu and a full-time employee at Four Seasons Resort O’ahu at Ko Olina. In addition to her already demanding schedule, Symphony finds time to volunteer at Lyon Arboretum; a 200-acre botanical garden located in the heart of Manoa Valley. Our scholarship programs provide financial assistance to nearly 20 students annually like Symphony, in support of their continued educational endeavors. This could not be possible without our partnerships with the University of Hawaii Foundation, the Pauahi Foundation, and most importantly, the generous support of our members through efforts like our Scholarship Golf Tournament. For more information on HLTA’s scholarships, click here. August 11th was a night full of anticipation as our State Office of Elections announced the results of the 2018 primary elections. Throughout the evening, I was at my traditional election night spot: on The Mike Buck Show, offering commentary as the first, second, and third printouts were published. I was joined by UH School of Communications Chair Gerald Kato, OHA Trustee Keli’i Akina, and former Lieutenant Governor Duke Aiona. I would like to commend all the candidates that participated in this year’s primary election for their willingness to serve, endure the rigors of campaigning and for providing voters with choices. As we head into the general election, we will be holding another round of endorsements for candidates interested in HLTA’s support. 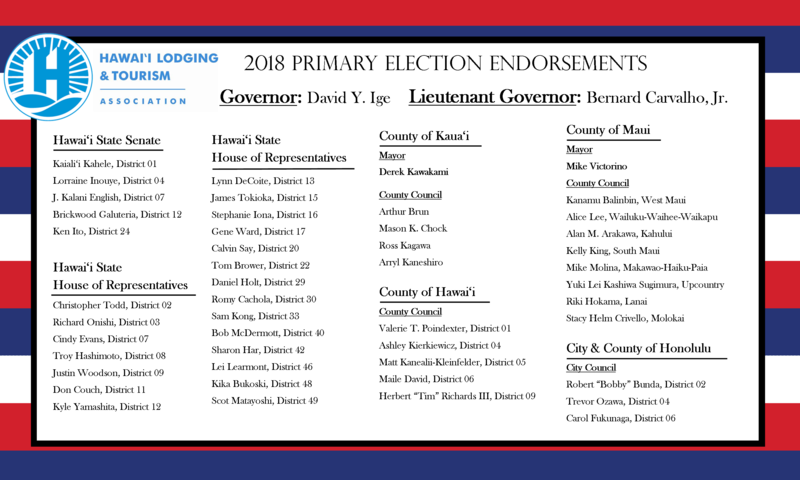 Additionally, we will be keeping a close eye on a few key races - at the state level, the Gubernatorial and Lieutenant Gubernatorial contests, at the county level, the Mayoral competition on Kaua‘i and Maui and some key Constitutional Amendments that will be on the ballot in November. For information on the 2018 Primary Election results, click here. Mahalo to all our golfers who came out yesterday, August 9th, to our 19th Annual Scholarship Golf Tournament at The Hawaii Prince Golf Course in Ewa Beach. Our annual tournament is an all-day affair filled with lots of ono food and fun in the sun, but best of all, it’s for a great cause. This year we sold out 82 teams with 246 golfers participating in the tournament. ​The scholarship monies we raise through this tournament help to facilitate 18 diverse scholarships throughout the year. While many HLTA scholarships are geared toward students who are pursuing hospitality-focused curriculum, we also offer scholarships to the children of members of our association. Other scholarships include partnerships with the University of Hawaii Foundation for community college and culinary programs, and the Pauahi Foundation. The reach of our hospitality industry is wide, and we continue to encourage the growth of our future leaders in whatever facet speaks to them. This year’s tournament featured three dynamic refreshment stations: ENPRO Environmental provided tacos, Mai Tais and Cigars; Interstate Restoration served beer and Sake from Young’s Market and had a live sushi chef and DJ; and Hard Rock Cafe featured pulled pork sliders with yuzu coleslaw and fresh apple slices. Mahalo to all our vendors who braved the heat and shared the spirit of hospitality with our golfers. A special shoutout to Justin Yoshino of Tripe F Holdings for generously providing 5 beverage purveyors on the course yesterday. HLTA has been sponsoring a radio show called “Tourism Tuesday” on AM690 THE ANSWER, via the Mike Buck Show with Mike Buck. We have been highlighting different members from all across the hospitality industry, for about a year now. And we would like to feature you – if you’re an active member of HLTA, and interested in sharing your contributions to the visitor industry over the radio in-studio in Kalihi on a Tuesday morning from 7-8am, please submit your request, a brief bio, and 3-5 talking points to Executive Assistant Ashley Yonamine at ayonamine@hawaiilodging.org. ​I would like to send a big mahalo to everyone who attended our Hospitality Industry Pau Hana event this past Thursday at Lucky Strike Social Honolulu. The evening was filled with ono pupus, complimentary bowling, and of course lively conversation! As we are in an election year, I took the opportunity to tie this particular HIP event to our mission of advocacy. With just over a week left until the primary elections, I saw this as a perfect opportunity to have HLTA’s endorsed candidates come out to meet our members. As we rolled into the night, I gave our honored guests an opportunity to address the attendees. I’d like to give a big shout out to the candidates that travelled both near and far to join us that evening. A warm mahalo to Mayor Bernard Carvalho, Ford Fuchigami - who was representing Governor Ige, Senator Lorraine Inouye, Rep. Tom Brower, Rep. Romy Cachola, Rep. Sharon Har, Rep. Sam Kong, Rep. Lei Learmont, Rep. Bob McDermott, Rep. Gene Ward, Councilmember Trevor Ozawa, Kika Bukoski, Bobby Bunda, Scot Matayoshi, and Pohai Ryan for attending our event and taking the opportunity to talk story with our members. On behalf of the HLTA, I would like to express our gratitude for your continued support of the hospitality industry and wish you the best in the upcoming elections! A special mahalo to our host Lucky Strike Social Honolulu’s General Manager Gordon Chow, and his team, for the exceptional service, and to Sukit Kanaprach of The Orchid Lei Company for the generous donation of beautiful lei. As of this past Monday, July 30 through Thursday, August 9, registered voters are able to visit early walk-in voting locations within their respective counties to cast their ballots for the primary election. This is a wonderful opportunity to ensure that you as a voter take advantage of your right and responsibility to vote. If you’re on the island of Oahu, you can walk-in and vote at Honolulu Hale or Kapolei Hale, Monday through Saturday, 8am-4pm. If you’re on another island, please click here for a list of your early voting locations. To check your voter registration status, or for more information, please visit elections.hawaii.gov or call 453-VOTE (8683). ​This year, we are pleased to announce that our 191st General Membership Meeting (GMM) will be held at the Four Seasons Resort O’ahu at Ko Olina from October 11-13. Kudos to Four Seasons General Manager Charlie Parker , who when I first broached the subject of having our GMM at his property has been working zealously with us to make it happen... We will have many activities for our members to participate, learn, exhibit, and enjoy; including a golf tournament, an industry lunch and learn, and government forums. If you are ready to register, or would like to see our tentative calendar, please click here. We look forward to seeing you in Ko Olina! ​Last month, HLTA’s Oahu Chapter raised a record $1,400 through their annual Back-to-School Supply Drive at Kahala Mall for Ali’iolani and President Thomas Jefferson Elementary Schools. These funds and school supplies could not have been collected without the hard work and support of our members, including a generous donation of $1,000 from Allied member, Drake Biel of Drake Biel and Associates. Today, per Drake’s request, we presented President Thomas Jefferson Elementary School Principal Garrett Zakahi with gift cards valued at $1,000 to go towards purchasing supplies needed throughout the school year. Mahalo Drake for the contribution to your alma mater, and for the support you have provided the keiki and the community.